Today I'm sharing an easy tutorial for a fun little project we did at home to add a little fun to our holiday season. We made a LEGO Christmas Mini Tree with some awesome LEGO garland! Affiliate links are used in this post. Our kids are super crazy into LEGO, especially LEGO BATMAN. We whipped this project up pretty easily and you can too. It's the perfect Christmas tree for any playroom. 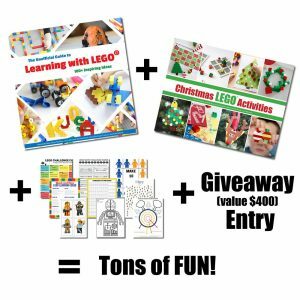 While you're here I wouldn't want you to miss out on a HUGE bonus we have going on for my Learning With LEGO Book. -> PLUS an entry into the 2nd giveaway which is a LEGO neighborhood worth $400. Yes, there are 2 giveaways! The 1st giveaway is open to the general public the 2nd giveaway requires a purchase of the ebook. Giveaway open to US & Canada. Get your Unofficial Learning with LEGO ebook today! Now onto today's fun LEGO Activity. If you have seen the LEGO Batman Movie, perhaps you might remember the Batman song, it's really hard rock music and it's all these bragging points about Batman. My kids love listening to this song with Alexa, and they love singing it, so it gets stuck in my head quite a bit. We also love making up new words to songs and this one is no exception. 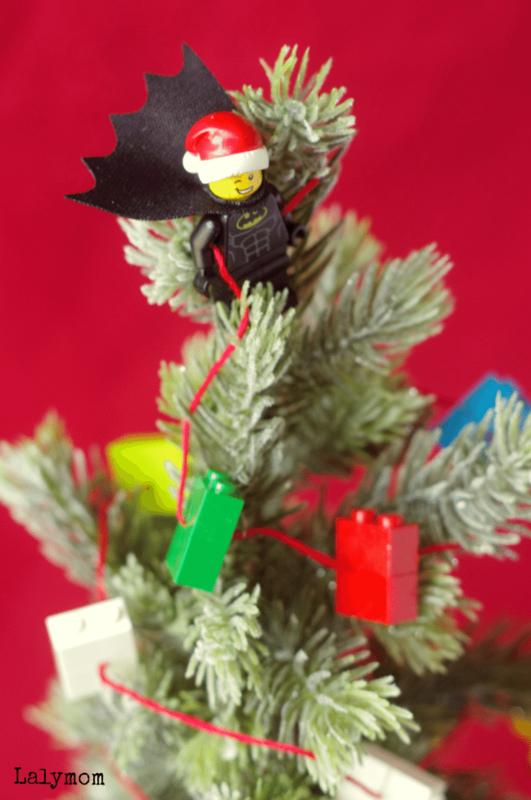 So we had to make our version of Batman's LEGO Christmas tree! I think this would make an awesome project for winter break, or the perfect LEGO Christmas Decor for any kid's playroom! When looking for a specific minifigure I like to search for a book that comes with a minifigure because often times when you buy just a minifigure it's a mystery pack and you don't know which one you will get. These LEGO Batman books show you which Batman Minifigure comes with it, in case that matters to you. Drape the red string around your mini tree as the base for the garland. Taking two matching 2X1 bricks at a time, click them together with the string in between them. Repeat as necessary around your tree. If you like to add minifigure you can push both of their arms behind their body, insert the string, then push their arms down along side their body. 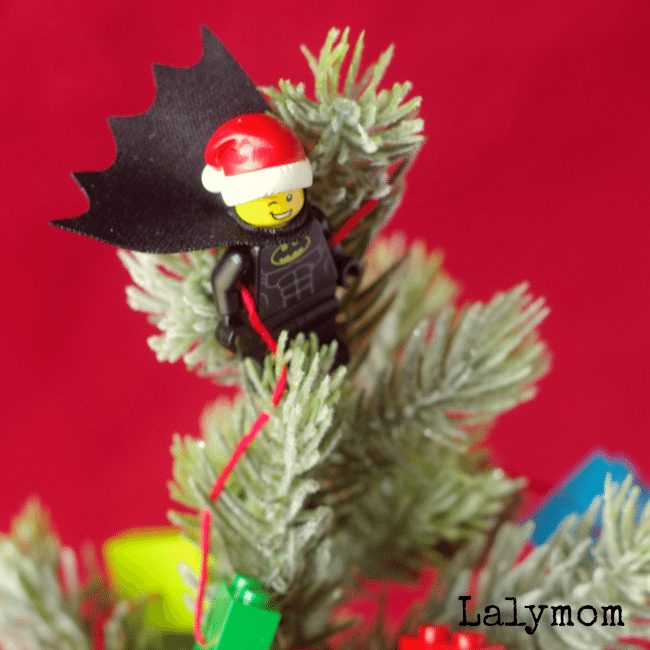 If you want to make Batman ornaments, take your Batman symbol pieces and attach them to three 4X1 flat pieces that are all connected in a U shape. You can also use a square frame piece if you have one. 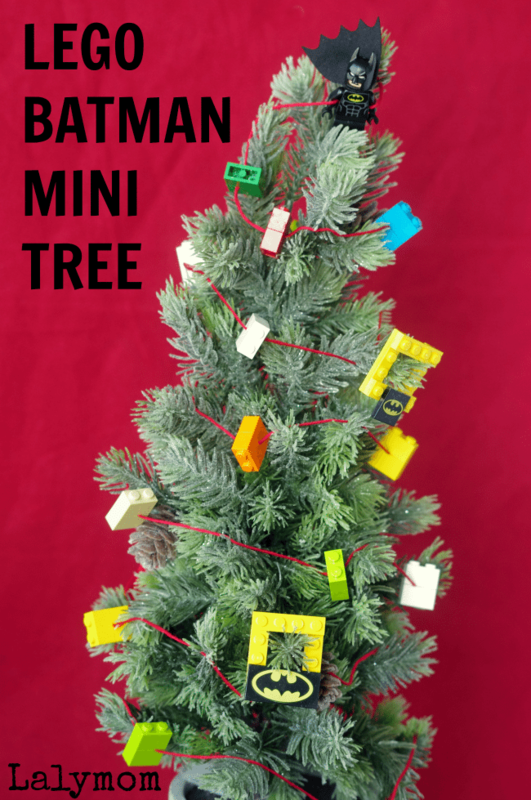 Enjoy your LEGO Christmas mini tree! How are you making it a very LEGO Christmas this year?